When I first went vegan almost four years ago, it wasn't a particularly easy feat to try and find exciting and delicious food that was readily available. I wasn't the best of cooks so tended to shy away from complicated looking recipes, and stuck to the same old meals time and time again. However, in the years I've been vegan, I've noticed that companies (especially supermarkets) have been recognising and catering for free-from diets more and more. One such company is Tesco, who not only have a wonderful free-from range of ready made food, but also support vegan customers by providing tasty and simple plant-based recipes to try at home. 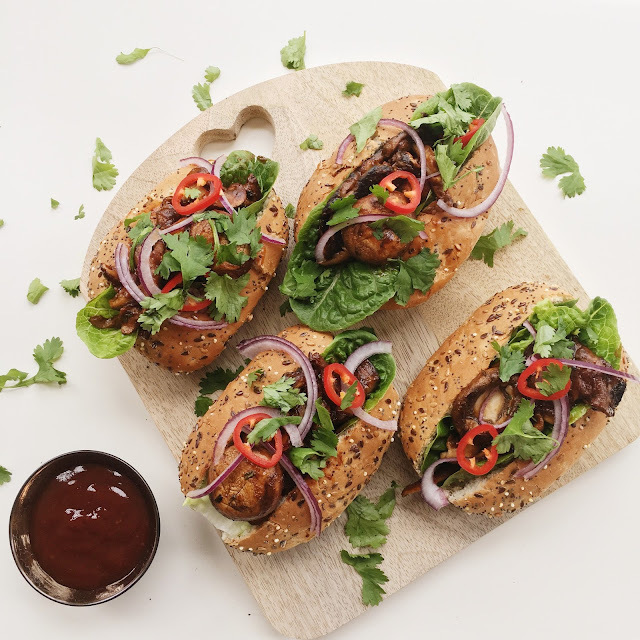 They've recently started their 'Food Love Stories, brought to you by Tesco' campaign which features an amazing recipe for vegan BBQ 'Shroom Buns by chef Derek Sarno; I tried this recipe out myself and let me tell you guys, it is insanely good! My boyfriend and I devoured the buns in an embarrassingly short amount of time, not gonna lie. Not only do they taste great but they're also nutritious and filling, so are the perfect dinner if you can't be bothered with a long and arduous cooking session! It was incredibly easy to find all the ingredients for this recipe as it mainly calls for fresh vegetables, something which Tesco have an abundance of. 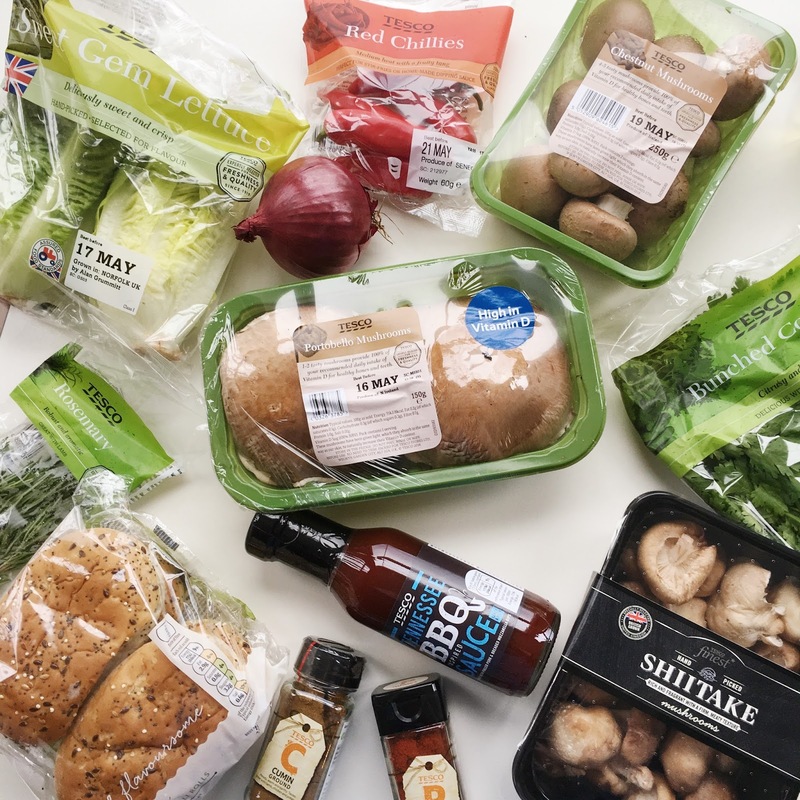 I personally do my weekly food shop at Tesco anyway so I know how good the quality of their fresh ingredients is, and I wasn't disappointed this time around! The cost of all the ingredients was around £10 which is pretty reasonable considering the recipe made a decent amount of food and not everything was used (for example I had leftover lettuce, chillies, fresh herbs and red onion to use in other recipes, and the BBQ sauce and spices can be added to countless other meals!). 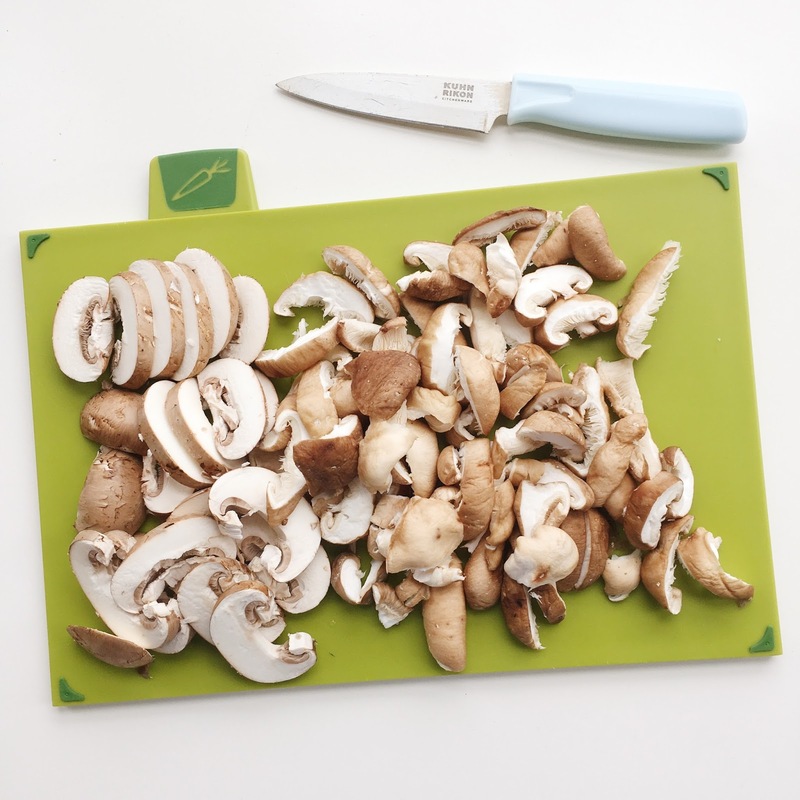 Once I got all the ingredients together I preheated my oven and started prepping half the chestnut mushrooms and all the shiitake mushrooms; please don't judge the mess I made of the chopping, I'm a terrible excuse for a food blogger. I then added some vegetable oil to a frying pan and cooked the portobellos and the whole chestnut mushrooms until they were juicy. I threw them into a bowl with the BBQ sauce and mixed everything together. By this point my boyfriend and I were salivating and so ready for the food to be done so we could just eat already because it smelled incredible! The recipe isn't time consuming at all, we're just very impatient people when it comes to delicious food. I fried the chopped mushrooms until they were crispy, added them to the bowl with the BBQ sauce and mixed everything together until all the mushrooms were coated. They then went on a baking tray and into the oven for 10 minutes. While the mushrooms were in the oven I enlisted my boyfriend to be my sous chef and got him to chop some red chillies and red onion; once the mushrooms were done, I fried some fresh rosemary, ground cumin and smoked paprika in a pan with some vegetable oil for a few seconds, added the cooked mushrooms and stirred well. and took us less than half an hour to throw together - win win! If you want to try this fabulous recipe out for yourself (which I highly recommend you do!) then I've popped it in this blog post for you; otherwise you can visit Tesco's 'Food Love Stories' page or watch Derek's video. Portobellos and transfer all the cooked mushrooms to a bowl. Toss in 2 tbsp BBQ sauce. 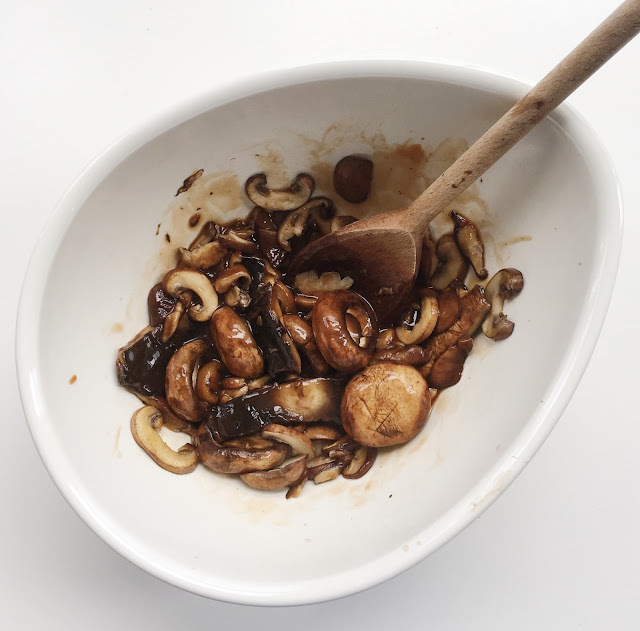 In the same pan, add another ½ tbsp oil and the sliced shiitake and chestnut mushrooms. Leave for 1-2 minutes, then stir and cook for a further 2-3 minutes each side, until crispy. Add to the bowl with the other mushrooms; toss. Tip onto a baking sheet and cook in the oven for 8-10 minutes. Remove; set aside. Fry the remaining oil, spices and rosemary for 30 seconds. Add the mushrooms to the oil, tossing to coat. Season.